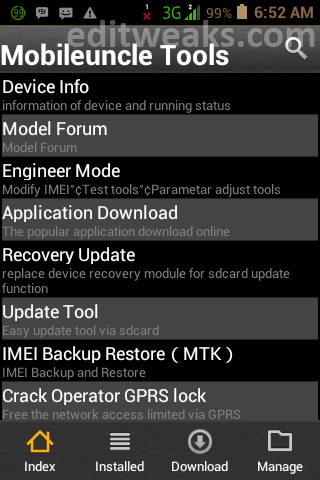 Repair or Changing the IMEI of your MTK / Android is now possible, this includes for MTK 6577 / 6575 , MediaTek MTK6592 / MTK6753 android devices, e.g:- Tecno, Gionee, Infinix, and few others, and this post will show you how to do it using Mobile Uncle Tools. 1. This tweak was initiated for the main purpose of educating our readers, we will Not be held responsible if this info is used for any illegal activity. 2. We reserve the right that if you get your device bricked during the process stated below, We won't be held responsible for any Damages. Meanwhile this post should be useful if your MTK phone is having problem registering your SIM to your network. Probably due to change of location. Note that when you use IMEI number of your old unused mobile phone, be sure to never insert a SIM of same network again. i.e >> If you use a Glo sim on a Blackberry (or any other phone), after you copied and use the Blackerry's IMEI into your Android, your Glo will work fine on your Android. But be sure not to insert that same Glo SIM into the Blackberry again, If you do and switch it on, the sim will not register to the network. 1. Dial *#06#, write down your Default IMEI, or Simply Back it up on ur SDcard >> See this Post on How to Backup IMEI on Android. In that select Phone2, because in most of these Chinese cloned phone, the 1st Sim which is a 3G will work perfectly. Problem only happens when we insert the second sim. Such cases are experienced if after you check, you can see the IMEI of 1st sim starting with 35xxxxx and the 2nd will start with 88xxxxxxxx. That is why the second sim is not able to register to the network, because its not in international formatted IMEI. So usually we need to change the IMEI of Phone 2. See IMEI EXTRA TIP UPDATED - FOR THOSE still facing issues changing their IMEI and those USING INFINIX HOT X507. 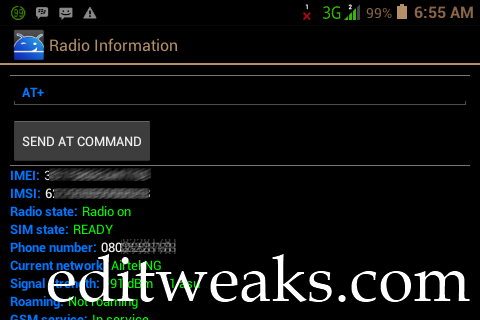 In the update We also unleash how to use Glo BIS on your Android. Why does everytime i do it italways says AT Commandis Failed to send . what else can i do now? What a wonderful article you've setup here, wonderful blog also.. It's good to know about how to change my Android IMEI, besides it's not legal, and above you stated it clearly at your disclaimer that it was just for educating your readers. All thesame, there are alot of reasons why you might want to change your imei, and I wrote on one on my blog, I think it would be interesting for you and your readers. I guess thats a hot one.. Thanks for sharing such wonderful info. Sir, Please is it compulsory to remove the sim before changing your imei or i should leave it in the phone and change it? I will be glad with the fast response. No, it's not compulsory to leave the sim in your phone, you can change your IMEI, with or without the sim in your phone. Thanks. Secondly, can I use my friend's bb imei for my own android but both of us are using same network (eg glo). Will it affect it to work. Can u also advise me on which type of android phone to buy, in terms of battery life, durability and the of with which one can easily get it repaired in the event of a damage? Pls educate me. Tnk u.
ADELEKE you are very correct with the command-line, just Press Enter and it'll take effect. You may use your friend's BB imei but try to be sure whether either of you will face any network errors, if such happens, you will have to remove his Imei from your fone and use another BB imei. Advising you on which Android to buy, it really depends on your budget, HTC & Sony Xperia are good ones with strong battery life & durability, changing IMEI on them is quite challenging though. MTK devices like Tecno, Infinix, Gionee etc are much easier to change IMEI and very much affordable. Tnks for ur assistance, ur advice really helped. God best u. Sorry l'm giving a feedback quite late. It was nice finding your blog. I must say you have a different variety of interesting Articles scattered all over your blog. Excellent designs and tutorials well detailed for better understanding. Imei tweaking is really one if not the best way to hit back real hard on Nigerian Telecommunication companies in terms of getting cheap and affordable Data bundles to surf the internet with. Such as the Glo bis and the current Etisalat Free 2GB data. How to do these things on non mtk device i.e. samsung, htc etc? The IMEI may not be the problem as long as you out the right digits, perhaps it's the Network you use or your location, you didn't state what network you used when you had this problem, but if it's Glo, you have nothing to worry about, many Glo users had been facing same 3G network problem for sometime now. You have nothing to worry about, the IMEI won't be affected, you can upgrade your Infinix Hot Note. Iost IMEI number on Micromax A106. when i try the above steps, i'm getting an error "AT command failed to send". Is there any solution for this. It seems the App didn't Support your device. Trying searching some Forums on the web. This blog makes for great reading. It's full of useful information that's interesting,well-presented and easy to understand. First be sure your IMEI is 15 digits in number. Secondly, there's some where we stated in the Extra Tip we Updated, that you may need to leave a Space. Click Here to read how to go about it, and hope it solves your issue. Is your Lenovo using an MTK chipset? I seem to have problem with this as it does not work on my injoo phone. any help on this? Thats tecno j7?are u sure u followed thr steps carefully? pls here is my email address...phatdiadem9@gmail.com OR phatdiadem@yahoo.com. Hi Doris, the case where you give space after AT+ Is NOT applicable to all devices (only few), so for your Tecno M7, go ahead and input the IMEI and do not give space when doing so. Press Send then you will get Command is mSent, restart the phone and check the imei again if it worked. thk u so much... it worked. remain blessed. 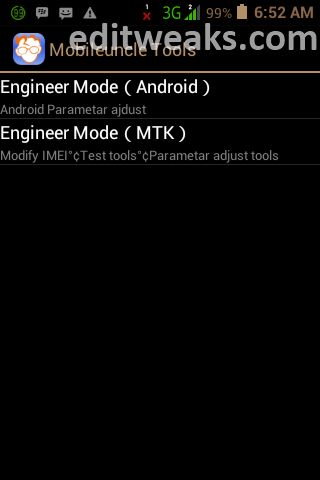 Please Edi Dominic Ifediri, I'm using a gionee s plus and this mobile uncle mtk tools does not show engineer mtk after you click on engineer mode. It only shows engineer (android). What do I do...... Please help. Hi Chidinma, Did you check your APN settings? Fixed my mobile IMEI with your help. Hi, Sony Xperia M2 is powered by 1.2GHz quad-core Qualcomm Snapdragon processor so it won't work. This method work only for MTK (MediaTek) processors.